Why do Superman movies keep featuring the same old enemies? We only just learned Zack Snyder is directing the Superman reboot, and already the word is that General Zod is coming back as the villain. Seriously, we have to ask: where the hell are some new Superman villains? There's this pervasive myth that Superman only has three good enemies: an evil version of himself, Lex Luthor, or a crapload of kryptonite. It doesn't help that we're five movies in and the films have done absolutely nothing to dispel that idea – all five movies featured kryptonite and Luthor (or, in Superman III, his non-union Robert Vaughn equivalent). And between General Zod, drunken clone Superman, and Nuclear Man, the best the middle three movies could muster was some variation on an evil Superman. So yeah, I guess I can forgive the wider public for thinking those are the only worthwhile villains the Superman mythos has to offer. Admittedly, there's a kernel of truth to this idea. Superman definitely doesn't have a rogue's gallery on par with Batman's or Flash's, and it's certainly a lot harder to pull off convincing Superman villains than it is for, say, Spider-Man. Just ask the creators of Superman: The Animated Series, who will freely admit they struggled to come up with enough villains and enough decent stories to tell about them. But we're not talking about an ongoing series here – we're talking about a movie franchise, which means a villain only has to have one great story to make that character a worthwhile adversary. So here are five villains we believe would make fantastic cinematic foes for the Man of Steel. Brainiac, Brainiac, a thousand times Brainiac. The fact that we're five, almost six movies in and we still haven't gotten so much as a mention of Brainiac is absolutely ridiculous. For those unfamiliar, Brainiac is a living, humanoid computer from the planet Colu, who has given himself the twisted task of acquiring all the knowledge in the universe…and then destroying the planets from where he collected his data. His only keepsakes of the worlds he's destroyed are miniaturized cities, including the Kryptonian bottled city of Kandor. The animated series tinkered with his origin story a little, changing him to Krypton's all-seeing computer system and an accessory to the genocide of Kal-El's people. This gave him a more streamlined origin story, made him a more concrete threat for Superman, and it provided a better reason for why they so completely hated each other. All in all, it wasn't a bad alteration, but it isn't strictly necessary. The crucial thing is that Brainiac is just as strong as Superman (without just seeming like an evil Superman), he's much more intelligent than Superman (and he's the first to point that out), and his massive command ship is an extension of himself, which means taking on Brainiac involves fighting the whole damn ship. And the classic Brainiac story is insanely cinematic. You get to tease a massive alien invasion in the first act, as Brainiac's mysterious ship approaches Earth. When he finally does show up, all of Earth's defenses – Superman included – are useless as the ship hangs motionless in the sky, collecting all of Earth's data. There's some room to play around with our internet age paranoia – for instance, one can imagine governments' terror as he effortlessly downloads all their most closely guarded secrets. And then, once his task is completed, he prepares to destroy Earth…but not before bottling Metropolis, with all of Superman's friends inside. But not the big guy himself, of course. He's busy saving the world from destruction in a way that doesn't involve flying around the Earth really fast. And so, with the Earth saved from destruction, he has to head out into space in pursuit of Brainiac in a desperate bid to save Lois, Jimmy, and everyone else in Metropolis…assuming it's even possible to reverse the miniaturization process. 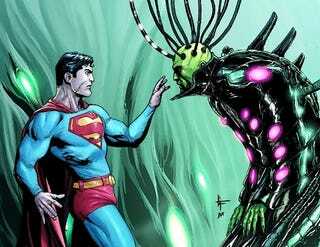 For a little added emotional turmoil, Brainiac can reveal he also has the bottled city of Kandor in his collection, forcing Superman to save either his past or his future. There's a lot of different ways to resolve that thorny dilemma – most likely, Superman ends up only able to save Metropolis, but you could always keep Kandor around as well, just in case you want to have a bash at adapting the recent, reasonably successful "New Krypton" arc. I certainly wouldn't complain. Parasite is pretty much the quintessential bread-and-butter Superman villain. He's not iconic or epic like Luthor or Brainiac, but he's probably the best of the second-tier adversaries, and one of Superman's better conceived villains. In both his original Raymond Jensen and later Rudy Jones incarnations, Parasite is a human transformed by exposure to biohazard chemicals into a being that can absorb the energy, intelligence, and even superpowers of anyone he comes into contact with. Here's the bad news for Superman – the more powerful Parasite gets, the weaker the Man of Steel becomes. Parasite probably isn't quite a strong enough character to carry his own movie, but he would be a great secondary villain or one half of an evil duo, perhaps making him the Scarecrow to someone else's Ra's al Ghul. Of course, don't underestimate a character's potential – it could be interesting to see Parasite start out as, say, Lex Luthor's pawn, only to see him absorb Luthor's intelligence and take on Superman directly. As a fun bonus, such a scenario would place Superman in the awkward situation of having to save Lex Luthor's life by defeating Parasite. If nothing else, Parasite could make for some amazing fight scenes. It's hard keeping Superman's power levels consistent anyway, and this is an opportunity to go nuts by throwing his powers all over the place, depending on his proximity to Parasite. It's a good way to see Superman lose his godlike status without resorting to the hoary old kryptonite cliché, and it could be interesting to explore how Superman acts when slightly depowered. Maybe bullets still can't kill him, but what if they can harm him? What if he can't fly anymore, but he can still, just to pull an idea out at random, leap tall buildings in a single bound? Even if this is all just the prelude to the real villain, Parasite would definitely make for compelling cinema. I'm not absolutely sure, but I have the sneaking suspicion that, after Lex Luthor (and maybe Richard Pryor), Doomsday is the most famous Superman villain. After all, the death of Superman was the last time comic books (and not their movie adaptations) were the engine of a massive cultural event, and the public probably still retains some vague memory that the big pale blue dude with the white hair and spikes on his arms did the deed. That's a bit of a double-edged sword, admittedly. Doomsday is famous for killing Superman, but he's only famous for killing Superman, so the audience kind of expects a fight to the death when Doomsday shows up. (Or you can do what Batman & Robin did to Bane, which took the man who broke the Bat and turned him into a mute sidekick to Poison Ivy, but I think we've all agreed that movie never happened.) Sure, you can bring audiences in with the promise of a fight so massive that even Superman himself won't survive, but what story do you tell once that's done? Both the comics and the cartoons have had a crack at the rest of the story, and neither completely works. The original comic story is suitably epic, but it's knee deep in a lot of early nineties weirdness, including a shapeshifting Supergirl, a revived Project Cadmus, and a clone of Lex Luthor pretending to be his own Australian son…or something. The first DC DVD movie Superman: Doomsday tackled the story, but the writers were clearly still adjusting to their new format, and there's material that only seems to be in there to skirt the edges of their PG-13 rating, including some very odd psychosexual tension between Lex Luthor and his Superman clone. And there's a more basic problem. Doomsday is, by design, the ultimate villain, so when you kill him off in the first half of the story, it feels like an anticlimax. There might be a better solution, though. The comics later expanded on Doomsday's origins, explaining he was actually the result of a rather shaky evolutionary experiment on ancient Krypton intended to create the perfect warrior. Although the scientists involved weren't Kryptonian, there's no reason why they couldn't be in a movie version. Indeed, one could even make it a relatively recent experiment, one that involved Krypton's last generation of great scientists…including Superman's father Jor-El. (Although you'd want to be careful with that twist – it could easily take a turn for the cheesy.) What would it say about Krypton's legacy if its people had created both the ultimate protector in Superman, and the ultimate killing machine in Doomsday? At that point, Superman isn't just fighting because Doomsday punched him first, he's fighting because the memory of Krypton depends on it. That allows for a more complete storyline than the original "Death of Superman" comic, which is essentially one long (and, to be fair, epic) fight scene. If you'd prefer to stick closer to the original "Death of Superman" storyline, then you're probably committed to going down the course mapped out in Superman: Doomsday, although I think there are better villains for the second half than Lex Luthor and a degenerate clone. I suggest you bust out Hank Henshaw, the Cyborg Superman, who's part twisted Reed Richards pastiche, part evil Superman, and literally unkillable, much as he actually desperate wants to die. He might not quite measure up to Doomsday, but he's still a hell of a villain with an awesomely iconic look. (I mean, he's Superman plus robot...what more could you want?) You can even tie together the space shuttle accident that turned Henshaw into the Cyborg Superman with the arrival of Doomsday from space, again allowing for a nicely streamlined story. There are other cosmic conquerors out there – Mongul has had his moments, and Brainiac more or less fits this category – but when we're talking about the ultimate evil, accept no substitutes. Darkseid is pretty much the biggest bad in all of DC Comics, bar none, and the goal of him and and his various minions from Apokolips is a terrifying one. Darkseid doesn't want to destroy the universe, or conquer it militarily. He wants to unleash the anti-life equation, the control of which would allow him to rob everyone in the universe of their free will. And, it has to be said, Superman: The Animated Series provides an amazing blueprint for how to realize Darkseid as a character. Some of what they did can't really be replicated in a movie – their slow reveal over several episodes of both his human and Apokoliptian servants wouldn't work in a movie, although you could have his human agents in Intergang show up in the movie right before the one starring Darkseid. But the series built two absolutely epic two-parters out of Superman taking on Darkseid, the first focusing on Darkseid's invasion of Earth and the second featuring Darkseid brainwashing Superman and briefly turning him evil, and either could serve as a great basis for a live-action Darkseid film. There are parts of Darksied's Fourth World mythology that wouldn't really translate well to the screen. As much as Orion and Mr. Miracle are fun characters, it would be tough to bring in their side of the Fourth World within a single Darkseid movie, and even given two movies it could be tough to do the entire mythology justice. Some of the more superficially silly Darkseid villains, most obviously Granny Goodness (who, to be fair, isn't a silly character at all, but that name could give studio executives and casual moviegoers some pause), might need to be cut in order to focus on Darkseid as a singular force of menace, with little else of the world of Apokolips developed in detail. With a track record like that, it's easy to assume that Superman and magic don't mix on-screen. And, frankly, I think the degree of difficulty is a lot higher here than it is for characters like Brainiac or Doomsday. But if the franchise ever creatively founders again and they need a last-ditch effort to save the series, I say it's time to break the glass and unleash Mr. Mxyzptlk. Who is Mr. Mxyzptlk, you ask? He's a mischievous imp from the fifth dimension, a mildly malevolent being of unlimited power and endless free time. In his earlier appearances, he was a cosmic annoyance for Superman, who he saw as one of the very few lower-dimensional beings worthy of his time. Mxy, as he allowed himself to be nicknamed, rearranged reality and made Superman's existence literally impossible until Clark could get the imp to say his own name backwards, thus banishing him back to the fifth dimension. These days, even that one rule doesn't apply to him, and he serves more as a sort of unfathomable cosmic mentor to an unwilling Superman, offering bizarre lessons whether the Man of Steel wants them or not. Now, writing Mr. Mxyzptlk isn't easy. The makers of Superman: The Animated Series say they could only come up with one wholly successful story for Mxy, and their later attempt to team him up with Bizarro proved to be just a bit too much forced wackiness. And, to be fair, Mr. Mxyzptlk is perfect for a cartoon, where the creators could mix their realistic style with Looney Toons inspired elements. Mr. Mxyzptlk couldn't be nearly as cartoonish in a live-action Superman movie, and would toning him down rob the character of what makes him interesting? Perhaps producer Christopher Nolan's last film offers a way to realize him on screen. Inception explores at great length worlds where the normal rules of reality cease to apply, and Nolan and company managed to portray the dreamscape without getting lost in insane imagery. The same approach could work for Mr. Mxyzptlk – tone down the more out there magic while still presenting Superman with a world gone wrong. And let's not forget new Superman director Zack Snyder's next film, Sucker Punch, which looks like it's going to mix real and unreal to awesome effect. One way to approach Mr. Mxyzptlk in a movie would be to make the first act all about him, then banish him and start up the more traditional plot with, say, Parasite. As the film progresses, Superman begins to suspect that things are still wrong, and Mxy is still hanging around somewhere, warping reality for his own unknowable reasons. Indeed, assuming this is meant to be the last Superman movie (or, more accurately, the last in the current franchise), one could even use Alan Moore's brilliant "Whatever Happened to the Man of Tomorrow?" as the basis for the story, bringing all the old villains back for one last appearance before the big reveal of the villainous Mr. Mxyzptlk. Now, make no mistake: these aren't the only good Superman villains. I already mentioned Metallo, who is a very solid villain, and there's also Toyman, who could be a wonderfully disturbing villain if handled right, and Mongul, who brings in the same cosmic conqueror angle without some of the weirder bits that Darkseid brings to the table. And this isn't meant as a direct criticism of the new movie - Zod is a great villain, and he could make a good adversary, particularly if the film doesn't just remake Superman II. This is a more basic point. Superman has some great, great villains that aren't Luthor, Zod, or some kryptonite. And the sooner the fimmakers (and with it, more general audiences) realize that, the better off we'll all be. Seriously, I'm tired of living in a world where Brainiac isn't a household name. He's way too evil to keep toiling in obscurity, and here's hoping the next, next Superman movie finally fixes that.